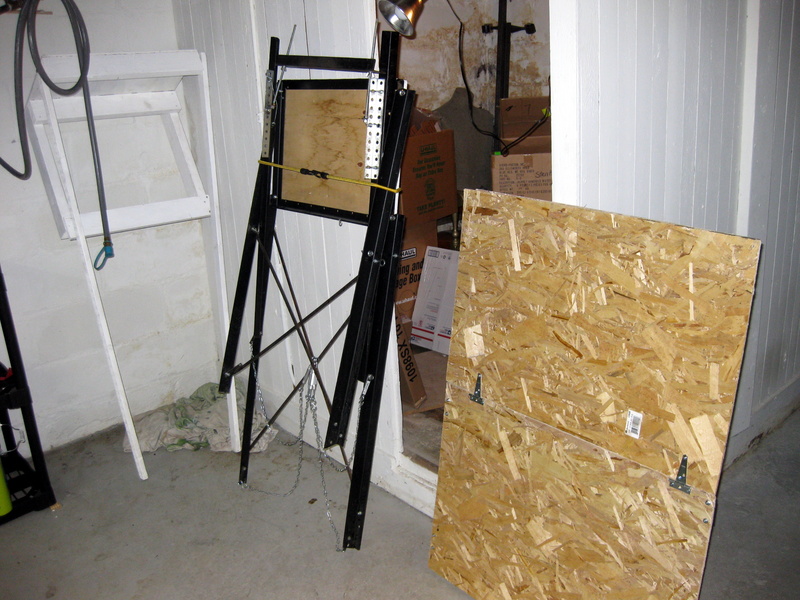 These constraints led me to a two-tier stand with a third tier attached separately. Inspired by two designs I saw on the green board I came up with an “A” shape where the MLT sits on top and the kettle rests on an extension of the horizontal crossbar. This shape is strong, uses a minimal amount of materials, and lends itself to being folded up. 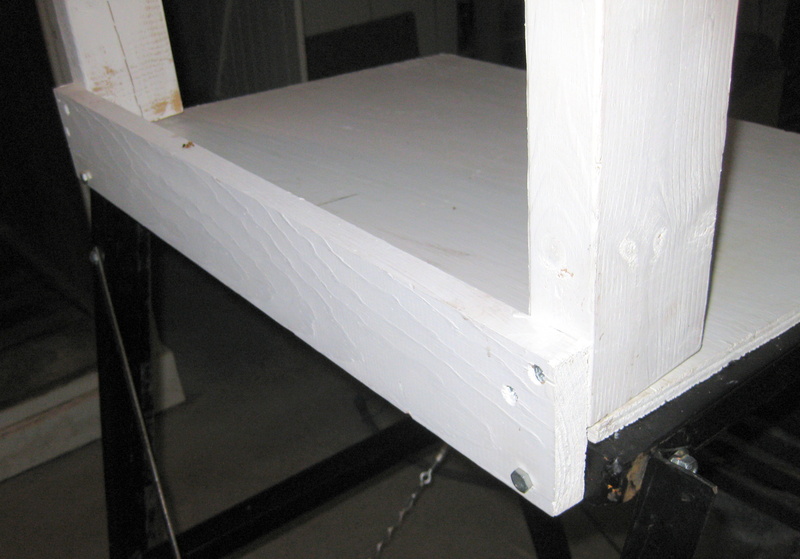 The angle iron was sourced from old bedframes. I’ve been using this stand since the summer of 2007 and it has served me very well. The photos below are a mix from when it was new and from 4 years past, so please excuse any rust! Here is the stand by itself. 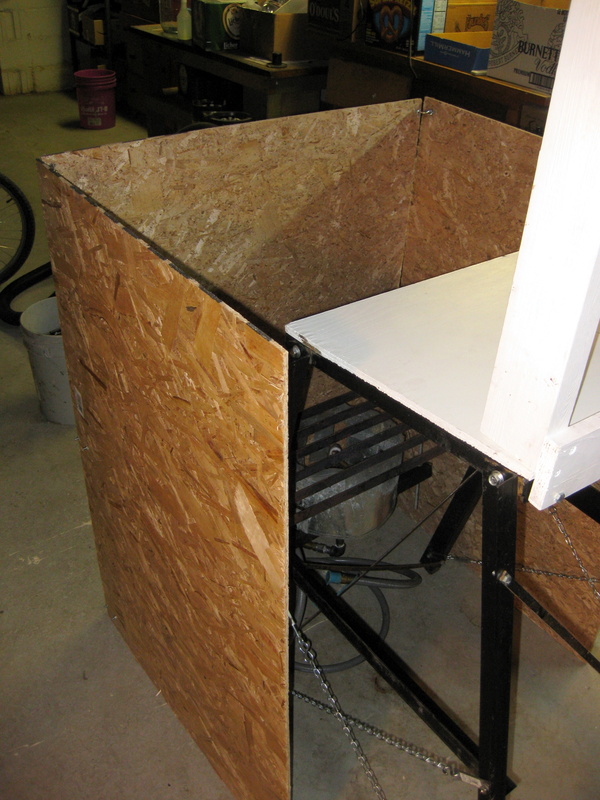 The top is a welded rectangle with a piece of plywood attached. 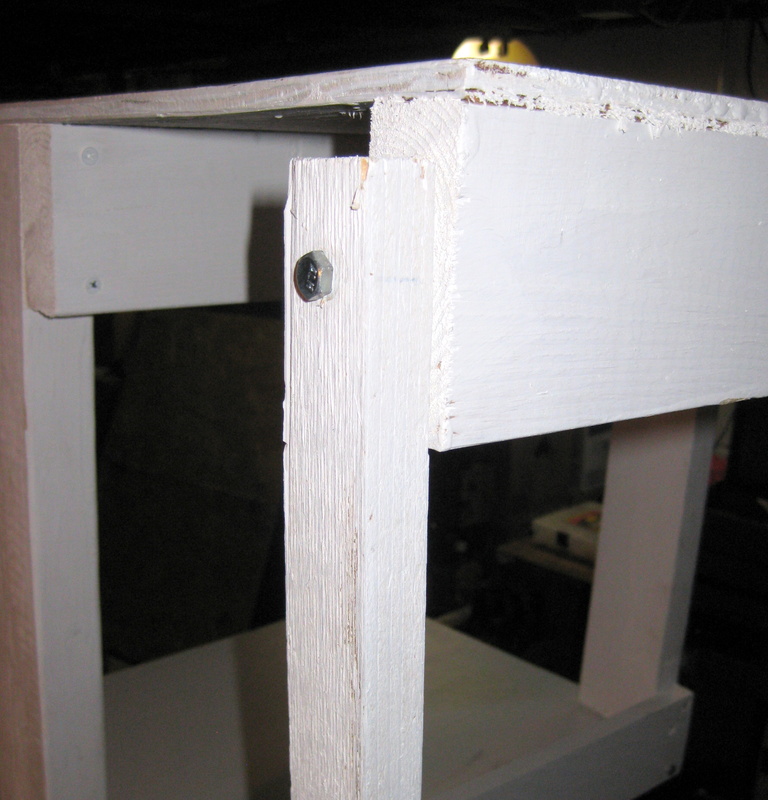 The legs are simply bolted onto the top with the horizontal bars also being bolted on. 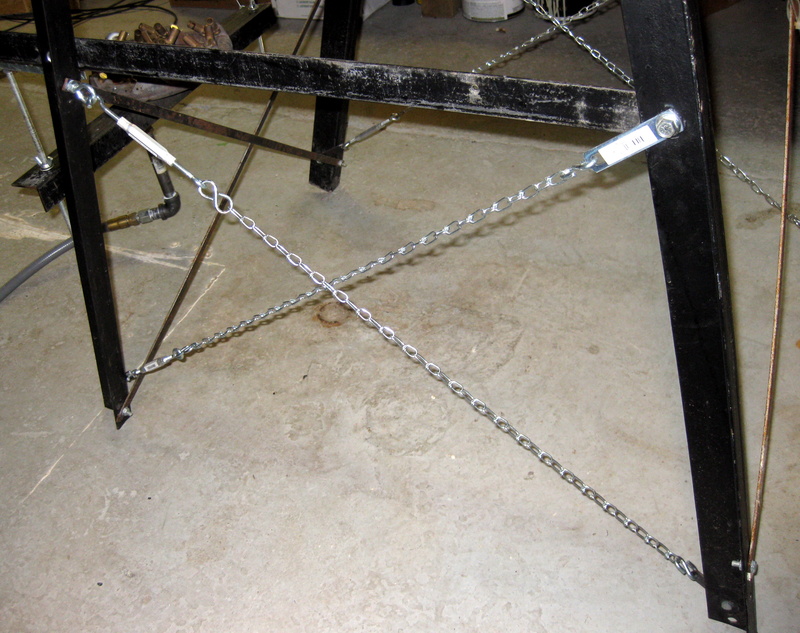 Lateral stability is provided by pieces of flat iron while front-to-back stability is provided by chains. By removing what I’ll call the “Kettle Platform Bolts” the kettle platform is swung upward while the front legs and top and folded up and back. 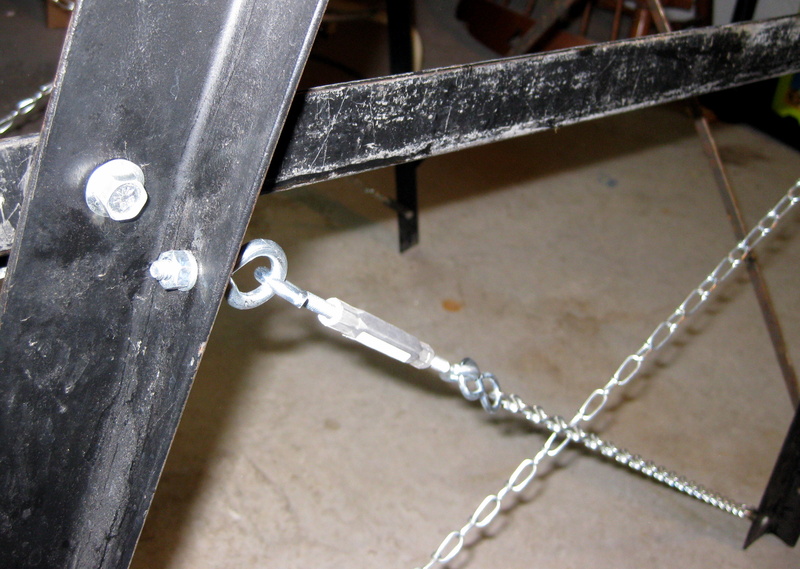 I use chains for the front-to-back cross braces because with turnbuckles they can be quickly removed to allow the legs to fold up. These two bolts (one on each side) are the only bolts that need to be removed to fold up the stand. Wingnuts make this even easier. When I first build the stand I didn’t know the proper distance between the burner and kettle so I made the burner bar adjustable with lengths of threaded rod. I’ve since settled on a good height but I certainly did go through a lot of trial and error getting there! 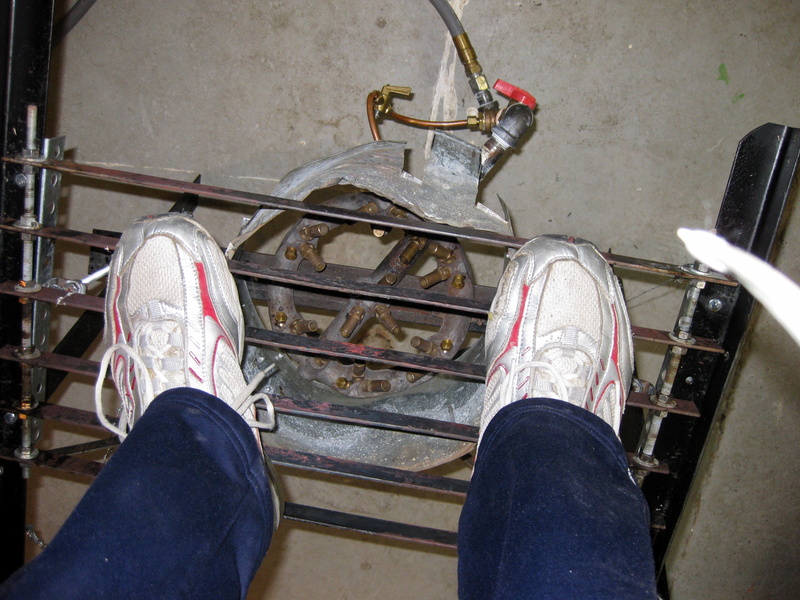 A short length of wire with a hook keeps the burner bar level despite the burner assembly torquing on it. The kettle grate is a series of bars mounted on threaded rod. 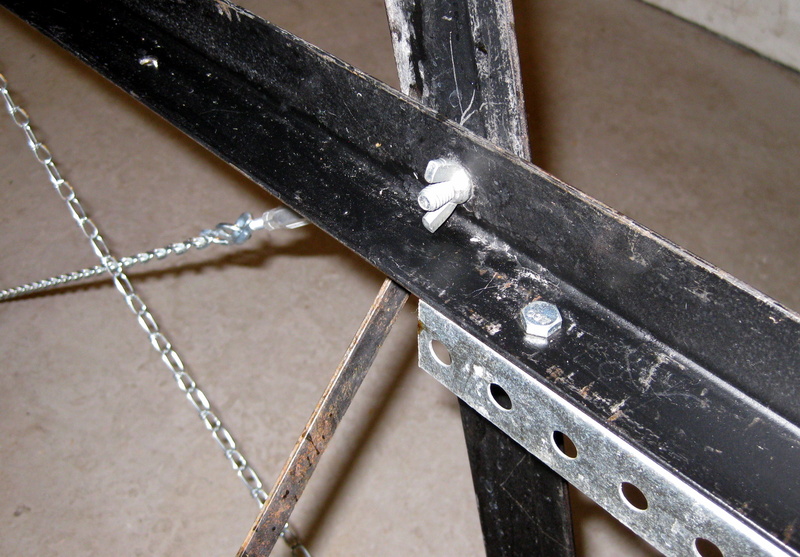 This assembly simply sits in the channel provided by the angle iron. The grate certainly looks like hell after four years of use but it still passes the “stand on it” test! 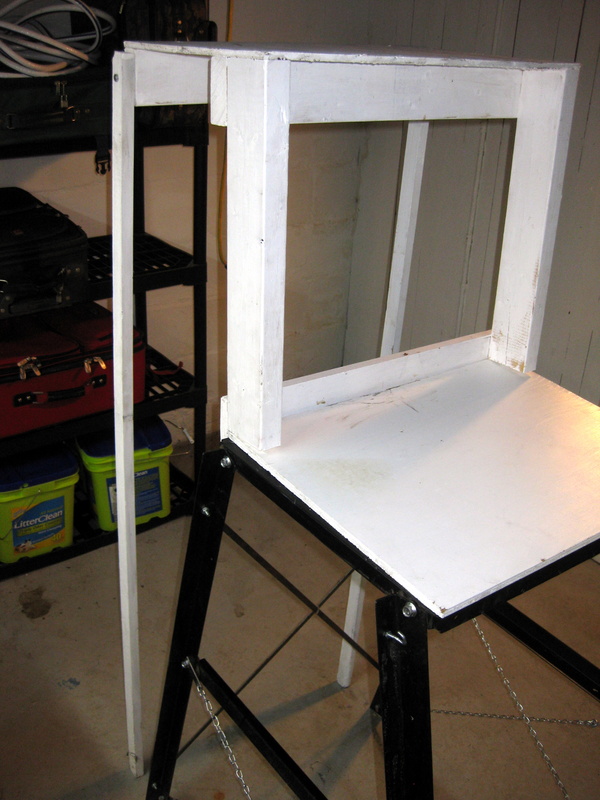 This is a good testament to the overall sturdiness of the stand, too. 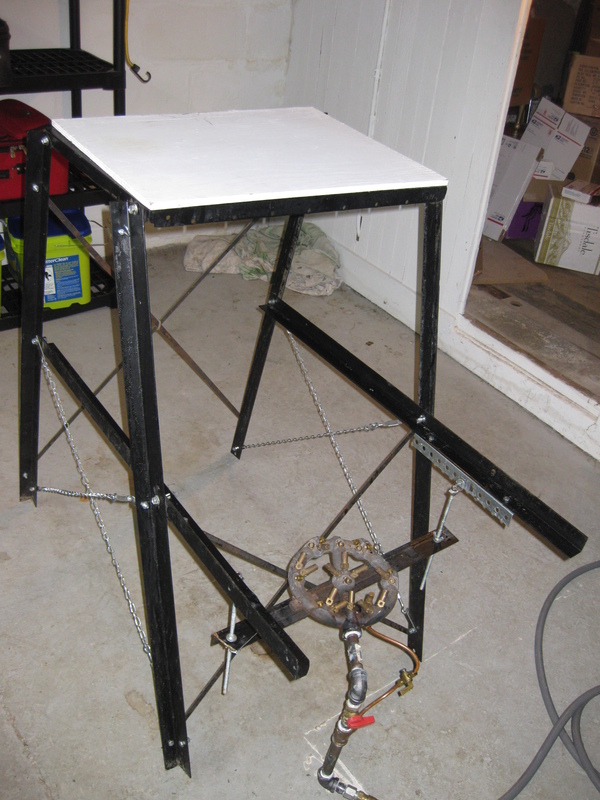 When I first build the stand I batch sparged so I didn’t need a third level. 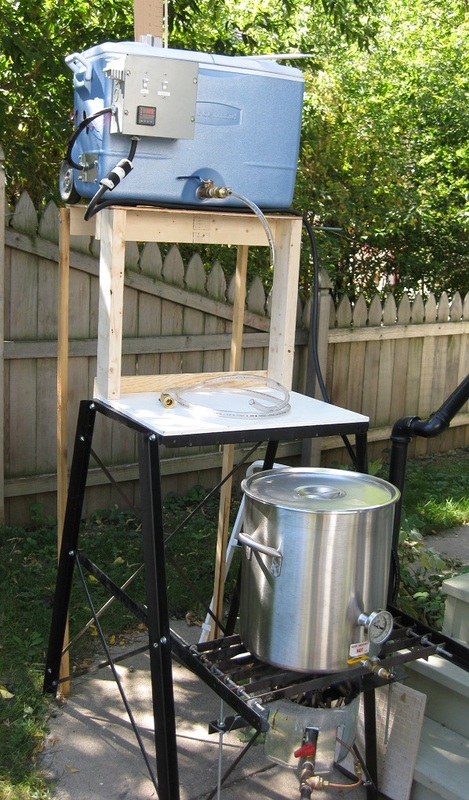 I’ve since switched to fly sparging so I made a simple wooden platform for my HLT. 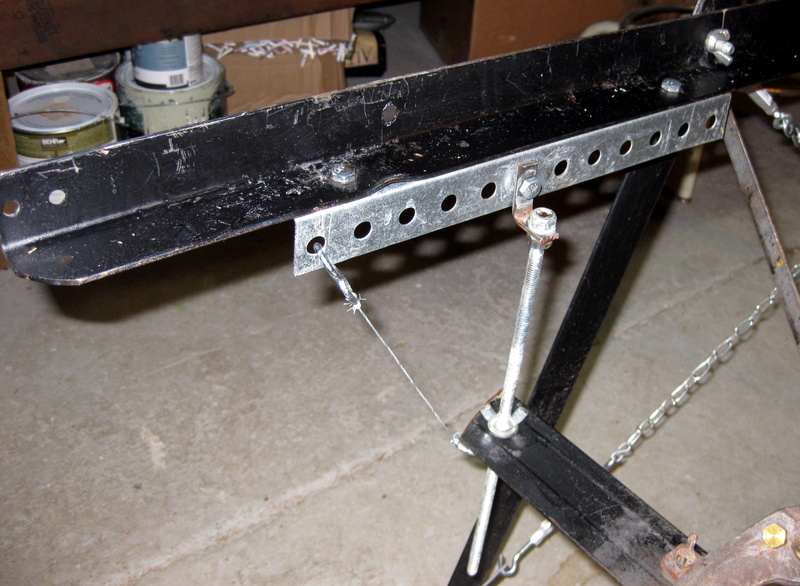 This separate arrangement works well because this part doesn’t need to be heat resistant and it keeps the size of the collapsed stand down to a liftable size. The piggyback bolts onto the back of the stand. My burner is a wok burner made by Town Foodservice Equipment, part number 226800N. It runs about $70 on eBay. It produces plenty of heat and a very clean flame. Google around for natural gas burners, you’ll find a lot of similar wok burners. The pilot light really isn’t necessary, it just makes it a bit safer to light. 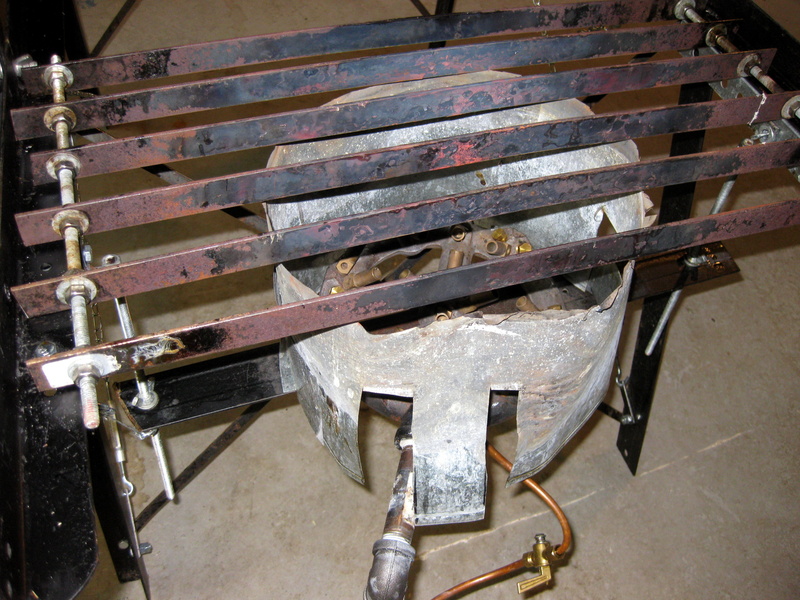 The above photo was the burner when new, below is the used state. It bolts to the burner crossbar with a long machine screw. Gas is fed in via an 8 foot, 1/2″ hose kit (#103091) from MB Sturgis; their current closest model is #103091. 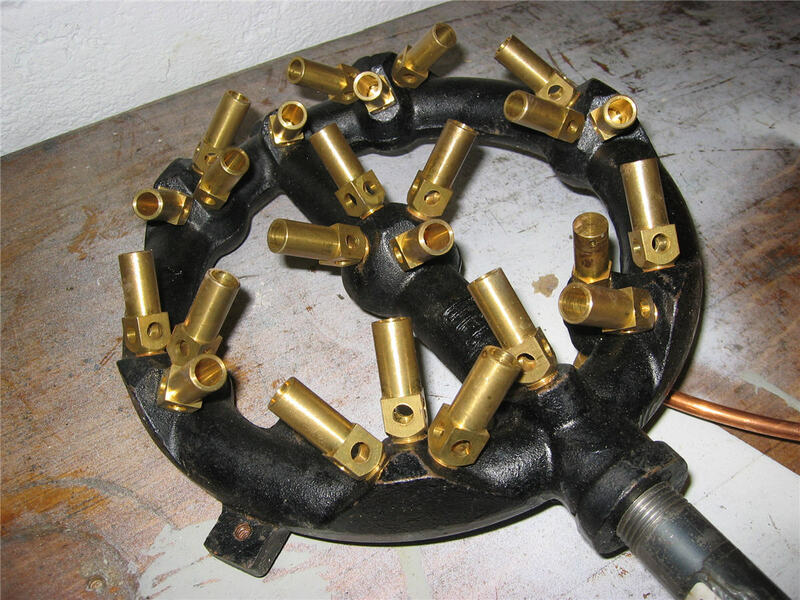 The valve pipe assembly is just a bunch of 1/2″ black pipe fittings cobbled together. 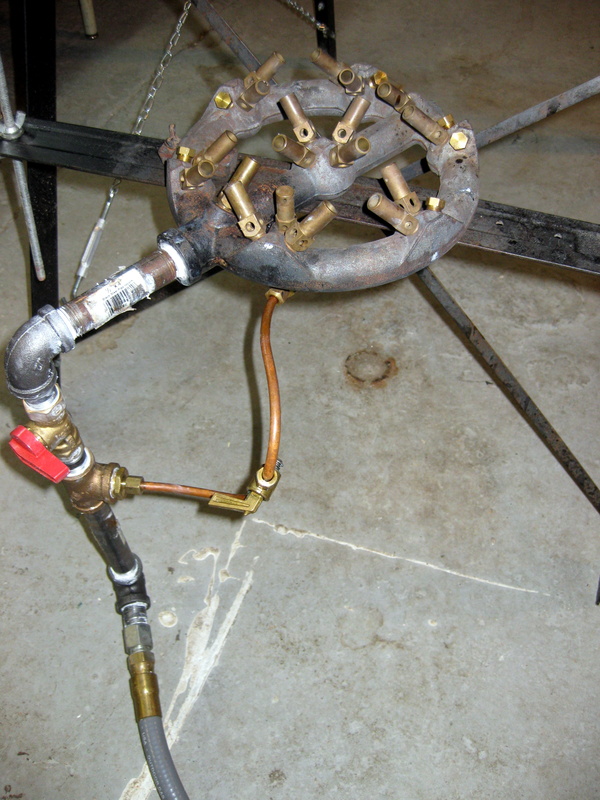 The copper line & valve feed the pilot light. This burner is over-powered for what I need so as you can see I’ve capped off a number of jets. This was necessary because the jets only burn cleanly when they’re at or close to max power. Lowering the gas feed (say to avoid boilovers) results in a dirty, yellow flame, so using all of them just wasn’t working out. In the above kettle grate photo you can see my hideous heat shield which is made from a piece of duct pipe material. To get consistent boil rates on those windy brew days I made a simple wind shield. 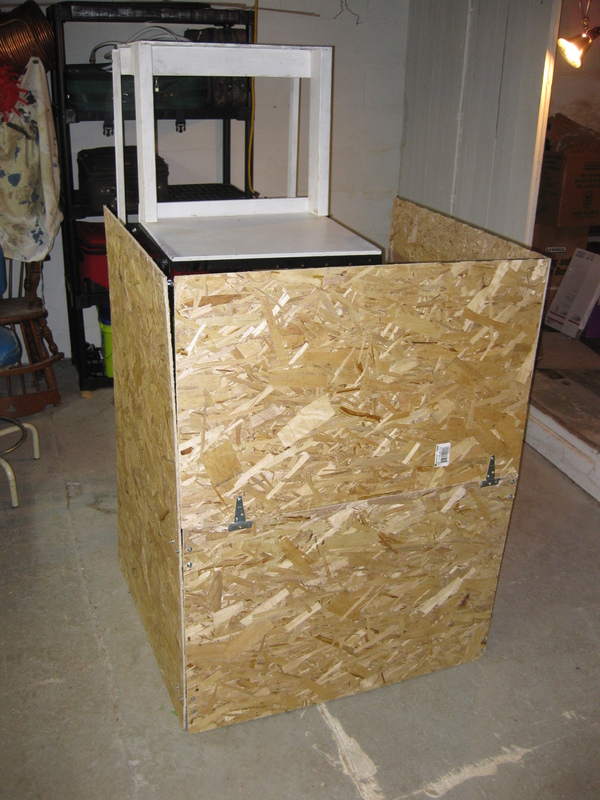 It’s a few pieces of 1/4″ OSB hinged together for collapsability. 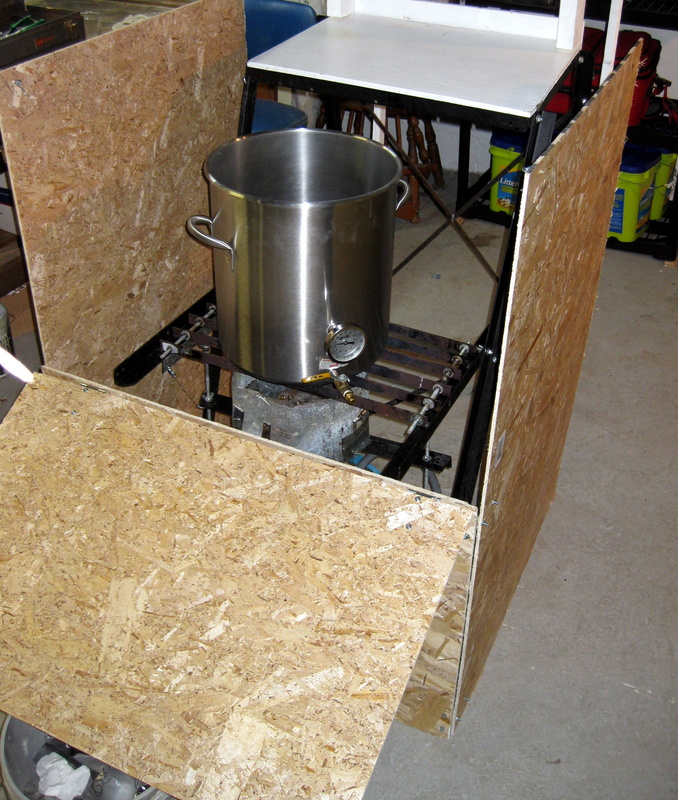 I made the front top able to be folded down to allow for kettle/burner access. All three pieces folded up and ready for next time! This has to be the crudest contraption ever made for brewing. Who would ever bother copying this idea; much less think someone would want to read the whole silly article. What a hater! There are many, many, cruder brewstands out there. What a douche. Dude took some time to build this and it works. And then he took the time to share it with us all. I think it’s awesome. Red doesn’t get that this is a utilitarian design, expects just glitz, not something on the cheap and functional track.